Growing up in the late sixties and early seventies, we all looked forward to the once-a-year Christmas specials. Long before Netflix and DVRs, if you wanted to see a Christmas special you had to be in front of a TV at 7:30 pm sharp. We didn’t always have a TV so we would often watch at a friend’s. My favorite Christmas specials included How the Grinch Stole Christmas and the iconic A Charlie Brown Christmas. I related to Charlie Brown’s underdog status. I went to school with unkind girls like Lucy. But the real joy came from the wonderful scenes with the ever-confident Snoopy and Woodstock. Snoopy’s scenes, animated to Guaraldi’s extraordinary music, are what made it special. 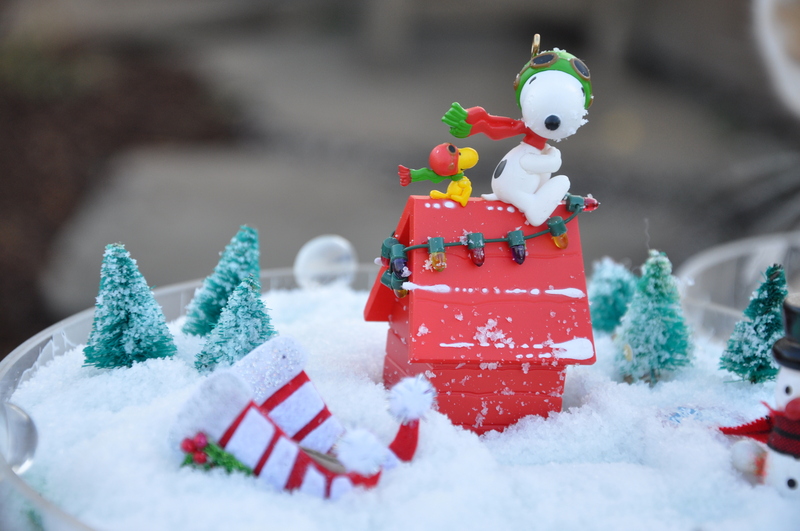 So when I decided to reprise my snow globe this year, Snoopy and Woodstock made it to center stage. 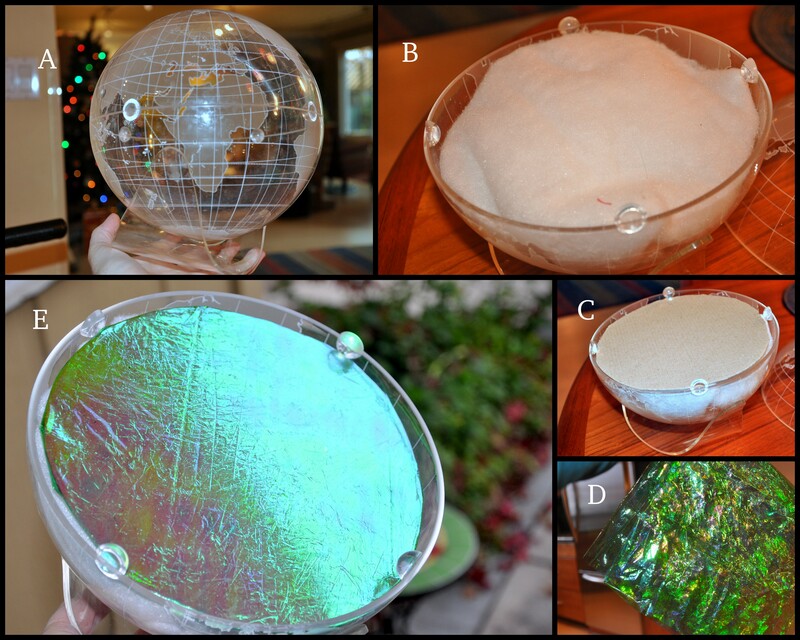 Several years ago, my friend Marcia gave the boys an acrylic globe. We’ve used it as a terrarium for a while till the plants outgrew it. Another year we filled it with round, silk ornaments. It’s also beautiful unadorned. 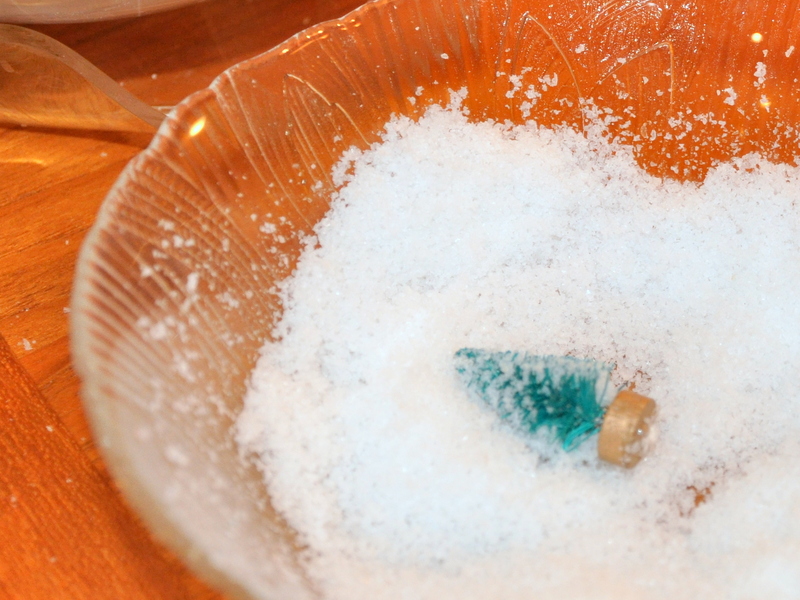 Two years ago I made my first snow globe with Snow-in-a-can, a gift from my friend Kelly. This year I filled the bottom of the globe with a scrap of poly fiberfill. I added a piece of cardboard cut to size. 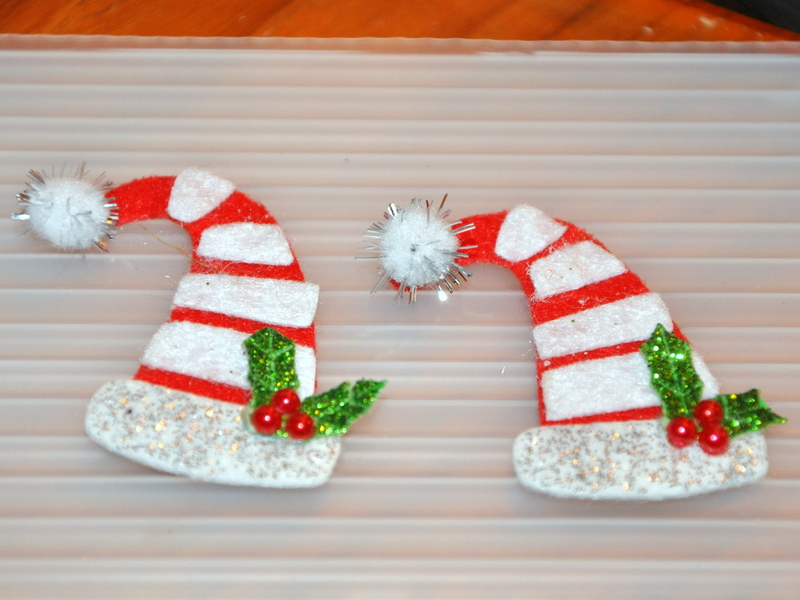 For some added sparkle, I covered the cardboard with a piece of iridescent cellophane I saved from last year. It once wrapped a plate of brownies from a friend. It reminds me of ice under a sunny sky. I opened a packet of Snow-in-a-can, added water and voila. 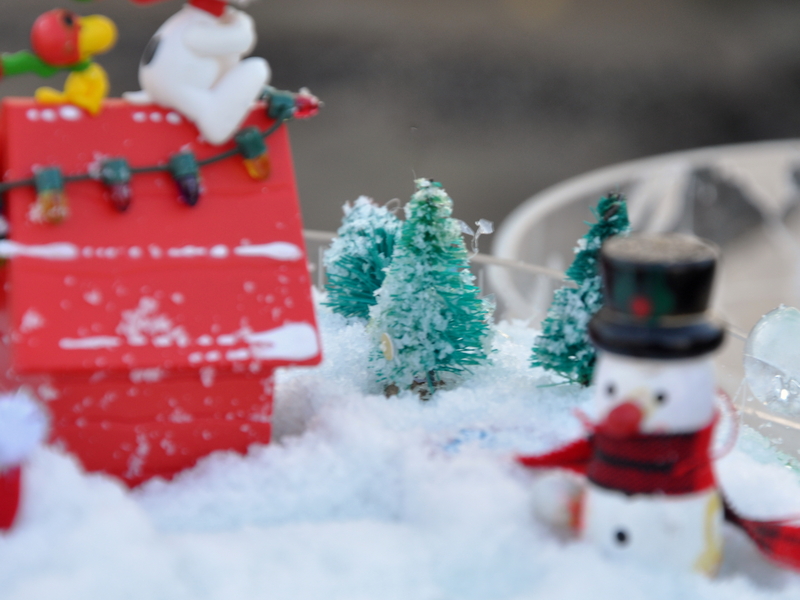 I rolled a few tiny hobby shop trees in the snow to set the scene. Santa’s sleigh came together using a pair of felted stickers. Our darling snowman is one of the tiny ornaments we bought our first year of marriage. His scarf is a gift from Kelly. Photographed outdoors to get the good light. The snow globe now sits in our living room. Mouse sits wherever he wants to because he’s a cat. 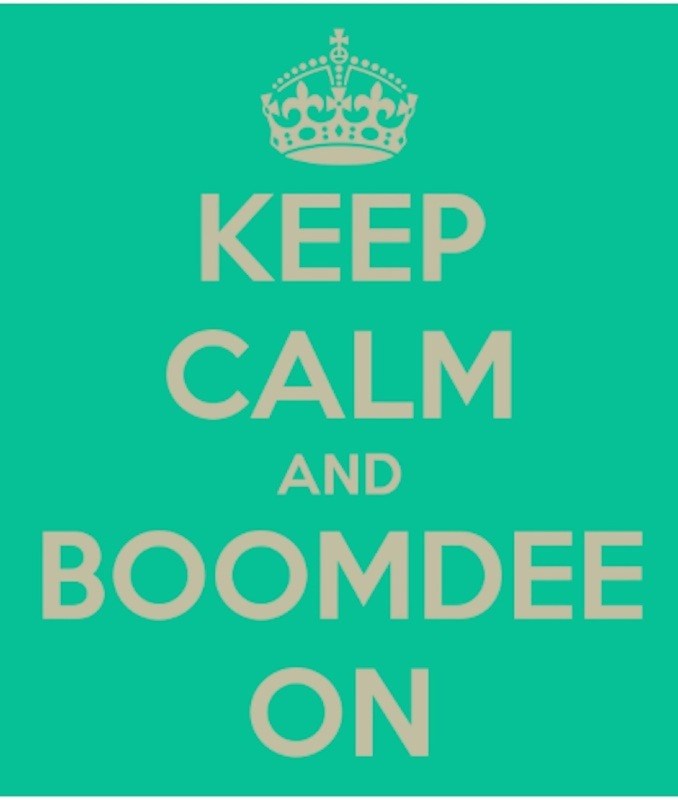 *WordPress should figure out a snow alternative for our blogging friends in the Southern Hemisphere. This entry was posted in Arts and Crafts and tagged A Charlie Brown Christmas, decorating for Christmas, DIY snow globe, Mouse the cat, Snoopy, Woodstock. Bookmark the permalink. Snow on the doghouse! I love that, Stacy. Putting this together was a wonderful reminder of special friends and good times. And I love the challenge of being creative with things that already surround me. I too love “White Christmas” and “It’s a Wonderful Life.” Classics one and all. What a cute snow globe. I love Snoopy. Will the fairy garden get its own snow globe too? WordPress could give us some gentle falling raindrops. That would be welcome. And a lot nicer than the massive hailstorm that came (for real) the other day. Oh dear! Sorry to hear about he massive hailstorm. They can really do some damage, too. I like the idea of gently falling raindrops. Someone else suggested falling petals. Either would be welcome I imagine from most bloggers. The fairy garden is next on my list. Each Christmas it gets a little holiday dress up. Please stay tuned. Petals would be lovely, too. Thank you, Cathy! Is it still green there or are you finally getting a bit of snow? I love the idea of raining petals! Still very green Alys… Snow always brightens up the dark days, so hope we get some in the new year! Gosh, the weather is so different around the world this year. I hope you get that snow. Ha! I forgot all about the snow effect on free wordpress. 🙂 Sweet Mouse. 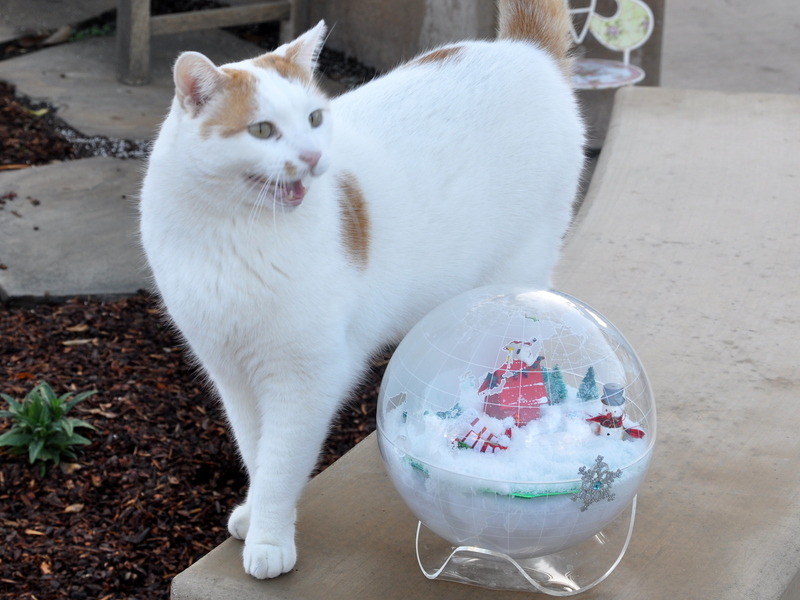 I think he’d approve of your snow globe even more if there was a cat in it. Good grief–was there ever a cat in any Charlie Brown cartoon? We managed to push record when the Christmas cartoons came on TV but we always missed Rudolph. We also kept the commercials in which was kind of cool later. Advertisements for Kate and Ally, York Peppermint Patties, Doublemint gum. What a hoot! I love the snow effect. It makes me happy every time I see it, perhaps triggering memories of my childhood home in Ontario, Canada. 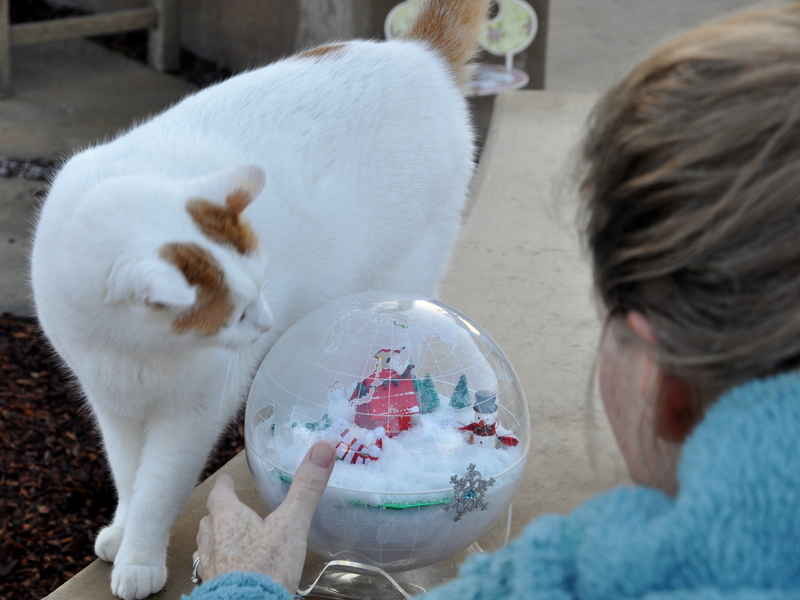 I will search the world over this year for three miniature cats for next year’s snow globe. I don’t want Mouse to feel left out. Ha! As far as he is concerned, the world already revolves around him. No hurt feelings there. What fun to have saved the old commercials. Those would be a hoot. Thanks for popping by, Leilani. Such a wonderful stroll down memory lane…I love snoopy to this very day. I’m glad this evoked some good memories, Charlie. I too have wonderful feelings about Snoopy. I’ve never seen an animated Snoopy movie – but still love the cartoons that now and again show up – Snoopy is a great favourite in this family too 🙂 This new version of your globe is wonderful – I thought the sleigh especially ingenious! This globe has been the most amazing gift don’t you think – I love how you keep reinventing it. I believe if I ever came across one I would immediately think of you and buy it just so I could play along! *I think WordPress still has to clock there IS another hemisphere! Snoopy seems to have universal appeal. It’s extraordinary to think that a cartoonist created a character based on a puppy, then infused that cartoon with so much life and personality. What a gift. I’ve been wanting to go to the Charles Schultz Museum but have yet to visit. It’s about a two hour’s from here, just far enough that I don’t quite make it since it would be four hour’s round trip. I’m glad you like the latest snow globe. I’m finally regaining some energy so I could sit at the table and create. It felt good. The globe has been an extraordinary gift. It has a simple elegance about it that invites creativity. Let’s all write to WP and suggest some southern hemisphere action. This is such a sweet, delicate snow dome. One of the things I love about your creations is the way you repurpose odds and ends — the hats becoming a sleigh is Christmas magic! I am glad that you have more energy, and that you are using your energy to create things that make you feel better. I always loved Snoopy too, and loved to borrow the comic books from the library. Anne you’ve brought me such joy with your comments. Thank you! I love the challenge of creating with this and that. It’s brings joy to the process somehow if that makes sense. It is such a relief to get some energy back. I guess your body guides you, so when I needed healing most, I needed sleep and rest, too. It occurred to me that this is the first week where I’m not needing a nap to make it through the day. Snoopy is a friend to all. What a remarkable creation. I like Snoopy, the doghouse, and Woodstock. It’s really nice to be able to repurpose the globe for other things. I love our globe. I’m thinking about forcing some spring bulbs in it next. It’s so versatile. Okay first: you will laugh at me but I read this sentence (I opened a packet of Snow-in-a-can, added water and voila) as “added water and vodka”. HA! Guess you know my mind is ready for a cocktail! Love the snow globe! What a clever idea, Alys! And yes, I remember the anticipation of waiting for those Christmas specials to come on TV. That was a big part of the fun: the anticipation! I did laugh! That is hilarious, Laurie. Nope, just water. I hope you found a nice cocktail to enjoy. Anticipation is a wonderful thing, isn’t it? It’s what makes so many things enjoyable. That globe offers endless possibilities for decorating, doesn’t it?! 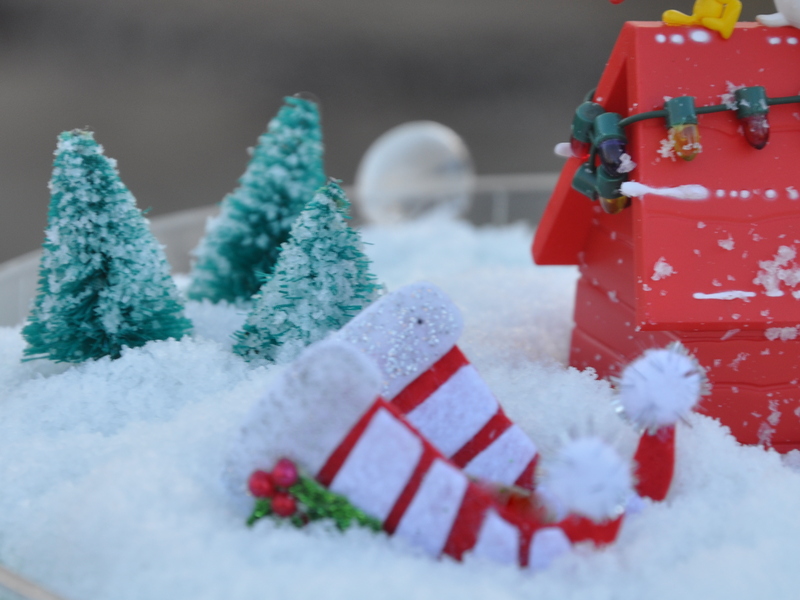 SUCH fun–and I bet it got you in the spirit of Christmas very nicely. Now I have the music from the Christmas version of Snoopy and the Red Baron in my head! Don’t you love that music? Decorating the snow globe did bring on the Christmas spirit. It’s dark and raining today, too and that really makes it feel like winter is here…and so it is. The solstice has arrived. Oh what fun it is to ride in my christmas haaa-at sleigh hey! One of my favourite Christmas movies is the one with the kid and his BB-gun and the leg lamp. The name escapes me now. But I also never, NEVER miss ‘The Apartment’ with Jack Lemon and a very young Shirley McClaine. The other characters are like a who’s who of Hollywood in the 60’s, including Fred McMurray as the rotten boss and David White (Darren’s boss in BeWitched). Jack Lemon is just so totally brilliant in it. I think it won several Oscars that year. Is that where the scarf came from?! Oh what a great story. I must remember to incorporate that into next year’s snow globe post. You are so clever. I loved all the treasure you gave me for that first year’s globe and can hardly believe it has been two years. Crazy! The little igloo is on our tree, along with a gift topper from you of a bird in an aqua nest and the glass garden tool ornament from, I think, last year. I think the movie you are referring to is Home Alone. I had forgotten about ‘The Apartment’, and should see if we can stream it through Hulu. We watched White Christmas last Friday. It’s been years. Such a magical time for movies. Yes, Mouse is one crazy character, that is for sure. It’s set in the 1950’s and really cute story. You’re tree sounds like a trip down memory lane. My house is looking rather bare this year. But since we’re going away, I didn’t want to have to rush to undecorated after Christmas. I’ve put your parcel under the tree though and we plug in the tree every night. I hope you get your gifts before the 25th. I mailed it last Thursday and they said 4 days. I’m so late on everything this Christmas. Oh! I vaguely remember that now. I clicked over to your link, and from there clicked to the movie link. I’m going to see if we can download it tonight. Thanks for the tip. We’ve connected on FB so you know your package arrived. I can’t wait for Christmas morning. When do you leave for your holiday? It will be so good for you to have a complete break from your busy work schedule. Maybe they will find a guest blogger for Kelly’s Korner so you can really relax. Good point about un-decorating the tree and the kitties. I wish I was in physio, but when I asked, she said walking and the stretches I’m doing now are my physio. When I see her in early January, we’ll reevaluate. I’ve been overdoing it a bit and end up tired with a swollen foot, so I guess it will just take some time. Blah blah blah. What a complainer. Love you!